o Provides confidence... ...You know your birds are getting the nutrients they need to keep them in top condition. o Economical... ...You pay only for the nutrients your birds require for body maintenance. o Reduced risk... ...Proper protein and salt levels provide maximum protection against cannibalism caused by imbalances of these nutrients. 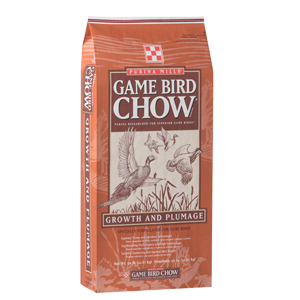 o Easy to use... ...One product contains all the nutrients your birds require, for all species of game birds. o Provides uniform nutrition... ...You know your birds are getting a complete, balanced ration in every bite.